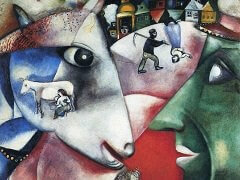 This is how the twenty-year-old Marc Chagall saw himself at the beginning of his career - every inch the "artist"! The picture proudly proclaims the self-conscious "Anch'io sono pit-tore" - "I also am a painter." 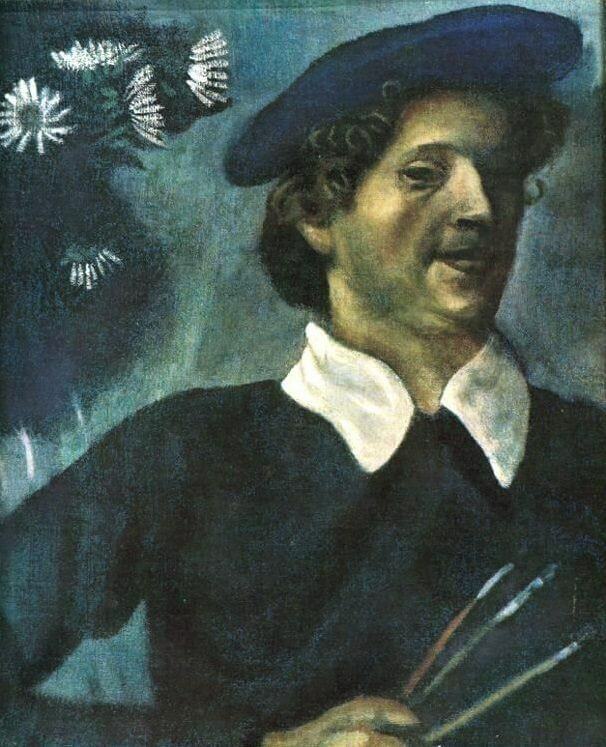 Like the museum paintings of the Italian-Dutch school, the portrait is built up in broad outline, with the surface area filled in decoratively; the artist has his beret over his curly hair and the weapons of his trade like daggers in his hand. 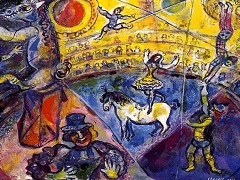 His attitude is characterized by naive delight in posing and in theatrical display, which was already evident in an earlier self-portrait, of 1908, showing him with a red half-mask in his hand. Here he regards the viewer with skepticism and an air of superiority. Except for the solid, formal buildup of the face from dark shadowy zones to warmly glowing light parts - which reveals a study of Rembrandt's self portraits - and the skillful ornamental gradation from the silhouetted dark zone to the subdued light sections culminat­ing in the eye-catching white of brushes, collar, and ornamentally stylized starflowers, the portrait would show nothing more than one of those "lads with curly hair and paintbox" who, as Bella recounts in her memoirs, made the young ladies of the middle-class Jewish intelligentsia in provincial Vitebsk feel a delicious thrill. 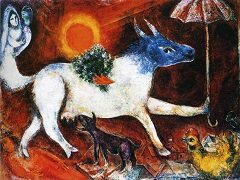 This kind of self-stylization seems completely at odds with the picture of a poor hallucinated youth, from a devout and impoverished small-town Jewish community in the Russian province, which Chagall sketched in his own autobiography and which has been constantly quoted ever since. 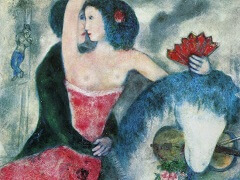 Yet, the difference between the two images is not so great, for the portrait shows the twenty-year-old Chagall just at the point where he is about to break out of his early environment. 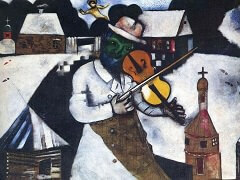 Marc Chagall had received quite a good education, in Vitebsk and later in St. Petersburg. 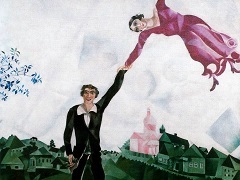 On coming home to Vitebsk for summer vacations - as, for instance, in 1909 when he began painting this Self-Portrait - he might well have felt himself an "artist" in this provincial milieu, for he was regarded as being such an exceptional personage.